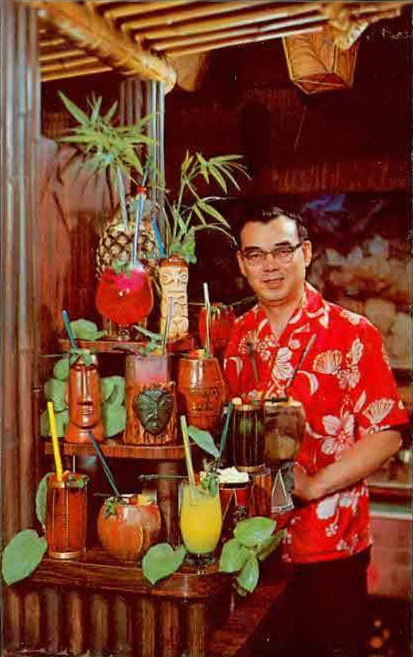 In the heyday of Polynesian restaurants, the 1960s and 1970s, the business attracted operators because of high profits in rum drinks. Their marketing relied on bar decoration, bartender apparel, drink names, elaborate serving vessels, and imaginative presentation. The same was true for “Polynesian cuisine.” There could be no such thing as a Polynesian restaurant without fabulously kitschy decor. It’s doubtful that Tahitians ate much in the way of Oriental Beef or Tahitian Flambee (flaming ice cream with rum). Not to mention Tossed Green Salads, Eggs Benedict, or Reuben Sandwiches. Its drinks, on the other hand, were hard to resist. With three bars on the ground floor alone, the Kahiki’s menu at one point illustrated drinks served in 30 different glasses, goblets, and ceramic cups and bowls. The most expensive was the Mystery Drink served with four straws. Its presentation involved a scantily dressed server, a gong, a lei, and a kiss. There were also Smoking Eruptions, with fumes emanating from chunks of dry ice, as well as Pago Passages, Malayan Mists, Tonga Tales, and Native Nectars. Beyond rum, customers were dazzled by the restaurant’s architecture, decor, and theatricality (e.g., periodic thunder and lightning). In the restaurant’s last decades its fans celebrated it as a temple of kitsch but, surprisingly, in earlier years it was often regarded as authentic. 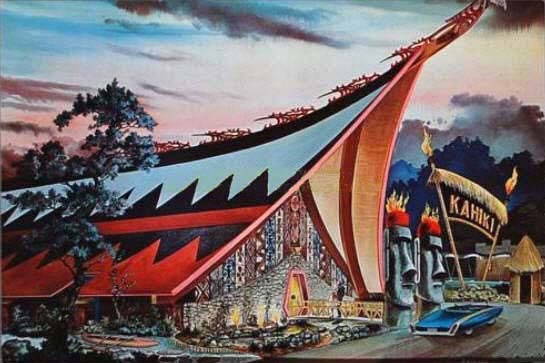 The building reportedly cost $1 million to build in 1960 and, with 560 seats, was the largest Polynesian restaurant in the U.S. In a flat landscape peppered with indifferent utilitarian structures, it was a startling sight that promised relief from drab ordinariness. Stepping beyond the up-swooping 50-foot facade the visitor entered a darkened Tahitian village with tall palm trees, waterfalls, thatched huts, idols, and a wild profusion of South Seas-style artifacts. The Kahiki’s decorator, artist and engineer Coburn Morgan, was a prominent Ohio restaurant designer whose career may have been launched by his work on the Kahiki. The flamboyant design of the Kahiki was undoubtedly due to him. In 1960, when he drew the sketch shown above, Morgan was head of the design division of the Tectum Corporation which furnished many of the composite building materials used in the construction of the Kahiki, including pressed wood for roof supports as well as for soundproofing and decorative wall panels. It may also have been used for flooring and for the stylized fish arrayed along the roof’s crest. 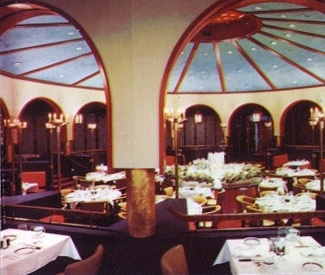 Following completion of the Kahiki, Morgan designed the Aztec-themed Thunderbird Restaurant (Lima), a red-fronted prototype for the Bob Evans chain (Chillicothe), McGarvey’s Nautical Restaurant (Vermillion), the Wine Cellar (Columbus), Jack Bowman’s Steak House (Columbus), the Brown Derby (Columbus), the 18th-century-themed Old Market House Inn (Zanesville), the Tangier Restaurant (Akron — pictured), Mawby’s (Cleveland), and the “Western Victorian-style” Judd’s (Cleveland). For theme-restaurant inspiration, Morgan traveled to the American West for the Bob Evans chain and to Lebanon for the Tangier, which was modeled on the summer palace of the head of state. The Wine Cellar, owned by Kahiki creators Bill Sapp and Lee (Leland) Henry, had a Shakespeare theme. When it failed in 1991 “16 tall carved knight’s chairs” and a “grand piano bar with winged dragon” were among the furnishings auctioned. During its more than 50-year run the Kahiki, which was also a nightclub and banquet center, entertained hundreds of thousands of individuals and groups such as Jaycee-ettes, senior citizens, anniversary and wedding parties, and so on. Despite its listing on the National Register of Historic Places and the efforts of local preservationists who felt the Kahiki was an important part of Columbus’ cultural identity, it was demolished in 2000.